A lot of people take credit for creating this dish, a winning combination of ground beef, mushrooms, and spinach made famous in San Francisco. To make my own version, I strived to get the texture of the eggs just the way I like them, a little like a frittata with well-seasoned ground beef, heavy on the spinach, and melted Monterey Jack on top. 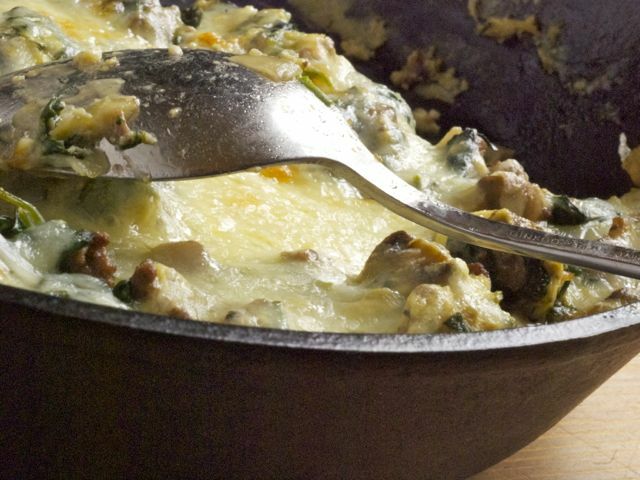 It's a lifesaving one-skillet dish for a late-night supper or a sleep-in Sunday brunch served with hot buttered toast. Pass the hot sauce. Heat the oil in a large skillet over medium-high heat. When it shimmers, add the onion and cook, stirring occasionally, until it begins to brown, about 6 minutes. Add the mushrooms and leave them to cook until they release their liquid and brown in spots, about 8 minutes. Add the ground beef, break it up with a wooden spoon, and season it with the garlic, marjoram, salt, and pepper. Cook, continuing to break up the ground beef until it is evenly browned, about 4 minutes. Mound the spinach on top of the beef, cover, and steam until the spinach wilts. Uncover, stir the spinach into the ground beef, and cook until the pan is nearly dry. Reduce the heat to low and preheat the broiler. Beat the eggs in a bowl with the Worcestershire sauce. Pour the eggs into the skillet, allow the eggs to set on the bottom of the skillet for 1 minute, and then stir to make large curds with puddles of eggs in between. Leave the eggs to set on the bottom for 1 minute longer, then stir once more. Turn off the heat, but leave the skillet on the burner. Sprinkle on the cheese and place the skillet under the broiler until the eggs are no longer liquid and the cheese is melted, about 2 minutes.